Spring has sprung in the northern hemisphere and it came in with cool mornings and warm afternoons. Spring also brought tree pollen which aggravates my allergies. With hankie at the ready, and the American River Bike Trail calling my name, I set out for a one-hour morning ride. I use the app, Map My Ride, which records my workout. I am always amazed at the stats, like how many miles I ride, how many calories I burn, my speed, and it provides a map of the ride. At the end of my ride, I had logged 15 miles, averaged 13.5 mph, and burned 1077 calories! “The American River Bike Trail (a.k.a. the Jedediah Smith Memorial Trail) hugs the banks of the American River as it flows through riparian habitat preserved by the American River Parkway. The trail runs for 32 miles between Discovery Park in Old Sacramento and Folsom Lake’s southwestern banks at Beal’s Point. The two-lane trail is completely paved, with mile markers, trail-side maps, water fountains, restrooms and telephones along the way. There are also plenty of places to stop to eat, rest or enjoy the scenery. Most of the trail is shaded and level, although the route does traverse some rolling terrain. Along the way you’ll pass through several parks and swimming areas, as well as through the suburban enclaves of Sacramento. As I rode the first 30 minutes, I made some mental notes of the spots I wanted to photograph on the ride back. You can see by the photos what a glorious morning it was. As I started out, it felt like I was the only one on the trail. Gradually, other cyclists and walkers joined me on the trail. When I normally ride on weekends, there is a lot of company, so it was refreshing to ride on this weekday morning with fewer people. Deer are also seen frequently on the trail. 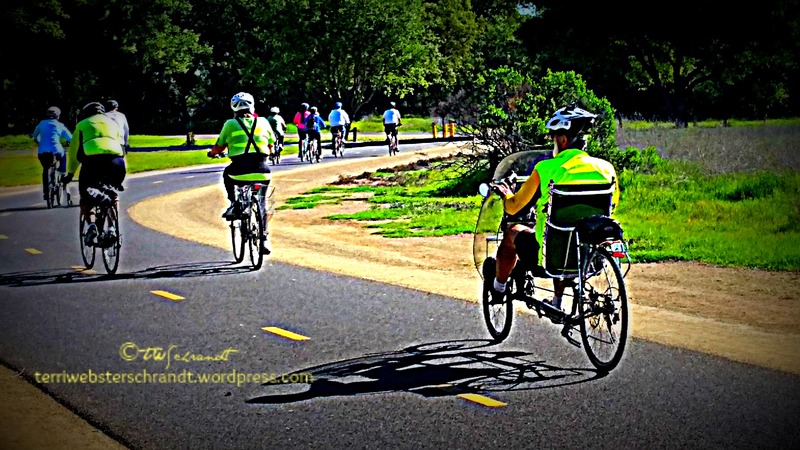 One of my favorite sights was seeing a large group of seniors riding along in a large group. (See the top photo). I assumed it was an organized riding club. Because the bike trail is a sanctuary for wildlife, there is a large variety of birds, including snowy egret, seagulls on the river, wild turkeys, geese and ducks. Squirrels cavort everywhere (nearly ran one down) and wary deer suddenly appear from behind trees, then go back to grazing. On one trip I saw a coyote bounding off into the woods! I am fortunate I live so close to this bike trail, and it is such a thrill to get out and ride. I hope you get the chance to get out and exercise on this spring weekend. If you enjoyed this post, please feel free to share it! Looks like the perfect spring day. We still have patches of snow here in NY State. The snow drops are blooming, but there’s no other color yet. Thanks for the lovely wildlife ride. Hee hee, ex Southern Californian! Thank you so much, Diana! Looks like a lovely ride. We are trying to get approval for a trail using the long disused rail corridor in our area and it has stunning views, history and an easy gradient. Unfortunately there is some minor opposition from landholders but we will keep working on it, for everyone’s sake – walkers, children, riders, mothers with prams, runners – it would be so good to have a safe place to ride away from heavy traffic and hills. Thanks for sharing your ride! Looks like an absolutely gorgeous day! Still a little too chilly here for a long bike ride without bundling up a bit….I’m sure we’ll get a bit more snow, too, before spring is here for good. Not so lucky here, spring arrived but not good weather. Wow, what an amazing trail! Wild turkeys? Deer? So pretty… I’m glad the squirrel made it out OK! Your 15 mile ride is very impressive! Bravissima! I love those tracker apps that count steps and miles… Keeps me literally on my toes! Thank you, Lia! You too! That bike trail looks glorious! We have a nice trail here that parallels the San Diego river but it doesn’t go that far. Lucky you! Isn’t it nice that, now that we are retired, we can get out and about on less-crowded days! Thanks! We are very lucky! That looks like so much fun and the photos are absolutely beautiful! We still have 6 inches of snow still to go Terri…LOL, but yes it is spring now. Yesterday we had 6C (in the 40’sF), and it was absolutely glorious. The snow has been melting gradually, which is wonderful (and glad we still have 6 inches of snow) when it melts too quickly there is a lot of flooding. Can You Dedicate Three Hours a Week to Physical Activity?